The fast-turning zone just below the rotating cap allow rapid twisting. 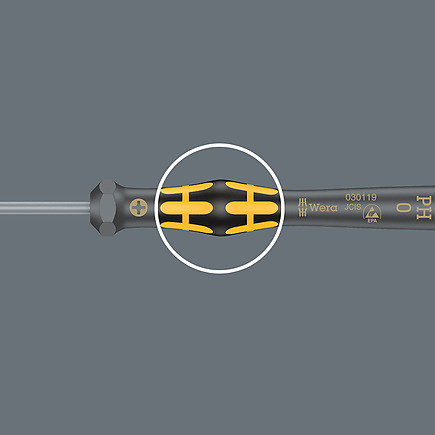 This makes time-consuming grip adjustments as with other conventional precision screwdrivers unnecessary. When doing screwdriving jobs on electronic components (like e.g. smartphones and tablet PCs), there should be no electrostatic discharge as this could cause malfunctions and a complete failure. 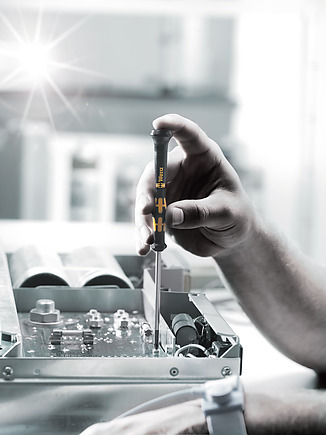 Therefore, tools that are secure against electrostatic discharge are indispensable. 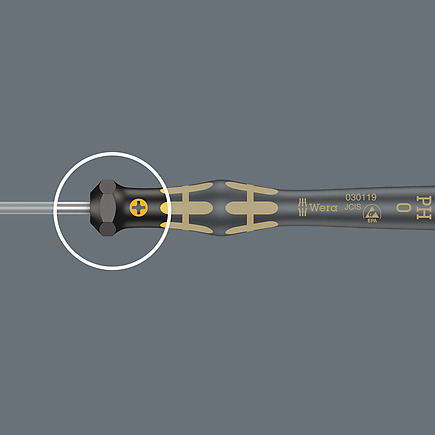 The requirements for ESD-safe screwdrivers are specified in the European standard DIN EN 61340-5-1. This standard also includes a handle that has to be out of a defined conductive material. 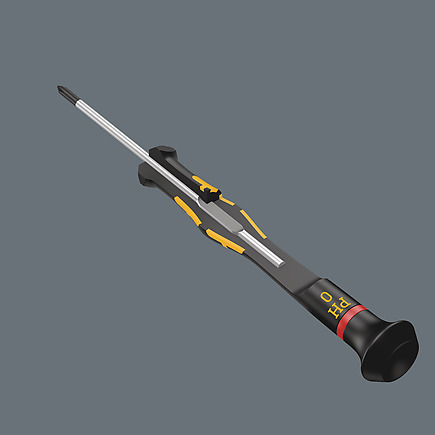 The Wera products in the ESD series satisfy these standards and the even more stringent requirements demanded by some technology companies. The electric surface resistance of the Wera ESD material is ≤ 10^9 ohm. 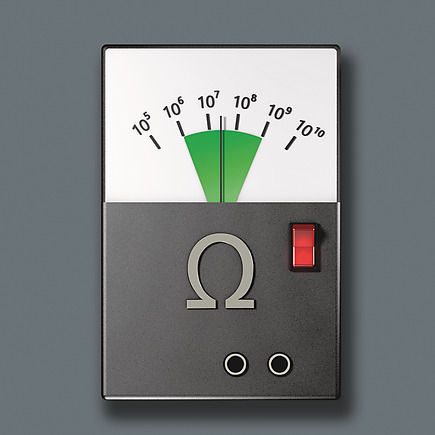 This securely protects components against electrostatic energy and associated damage. 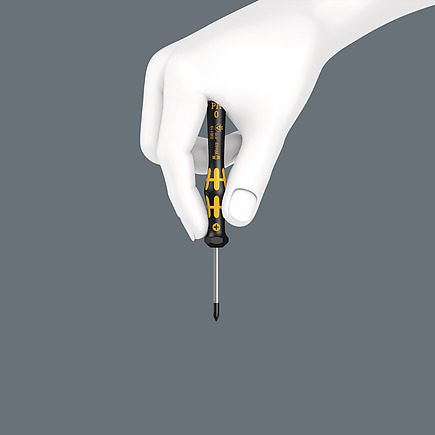 ESD-safe Micro screwdriver. Dependable protection against electrostatic energy and associated damage. Rapid twisting results from fixing the hand on the head and using the fast-turning zone just below. This makes time-consuming grip adjustments unnecessary. Power zones with integrated soft sections ensure the transfer of high loosening and tightening torque; a precision zone for the right rotation angle during fine adjustment work. 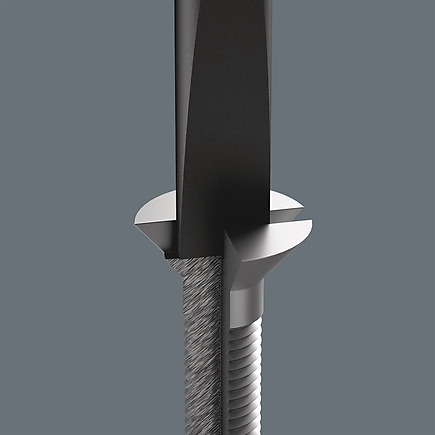 The Black Point tip offers optimised corrosion protection and an exact fit.